Organisations today exist in a climate where the need for change is ubiquitous, in view of the many dynamic, and sometimes contradictory, ‘drivers for change’, such as changes in the global economy, societal trends and new legislation. Substantial risk is involved in carrying out complex, difficult and often unclear major changes to the way an organisation operates. 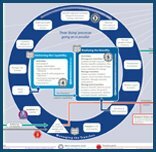 ‘Managing Successful Programmes’ (MSP) is a principles, governance themes and process based approach founded on best practice for use when managing a programme. Programmes are more than just the ‘sum of their parts’, in other words they need to ‘add value’ over their constituent projects. This leads to the inevitable conclusion that such a major ‘transformational’ change needs something over and above standard project management in order to make such a major change ‘stick’, and thereby realise benefits which are of strategic importance to the organisation. Managing Successful Programmes Practitioner is for those delegates who have already passed the foundation level qualification.The course equips delegates with a realistic and practical opportunity to consolidate their understanding of the MSP method, including its structure, processes, and governance themes, together with a range of management documents to aid progress through the programme lifecycle. Closing the programme and ensuring the ‘end goal’ has been achieved. Please note: To assist your learning there is some pre-course reading and activities that must be completed prior to attending your course. In addition, whilst attending your course, there will also be some examination preparation evening work . There is mandatory online pre-course work that must be undertaken prior to attending this course. It is expected that it will take approximately six hours to complete. You will be sent full instructions with a link to the online pre course within 48 hours of your confirmed booking.